While it’s not that unusual for twelve year olds to purchase CDs with money given to them by their grandmother, when young Amy MacDonald from Bishopbriggs, Scotland selected the album The Man Who by her fellow countrymen, Travis, little did she realize how strongly the CD would affect her. 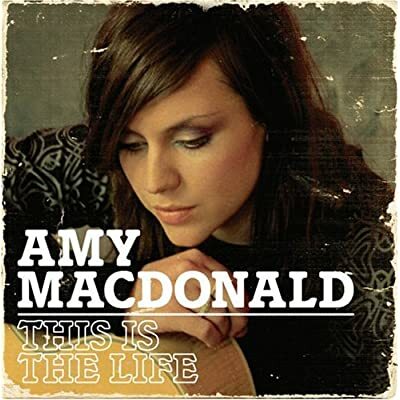 With their hits like “Why Does it Always Rain on Me?” Travis’s album is one I personally recall playing so often that I darn near wore out my own copy, but while I was content to listen endlessly, Amy MacDonald had a decidedly different idea. Picking up one of her father’s unused guitars and armed with “just a good ear and a few chord patterns found on the internet,” MacDonald taught herself to play the instrument without any formal training, instead urged on by her “huge burning, raging desire to write and play songs.” As her biography reveals, having left school early to focus on her music, despite securing admission to two universities, MacDonald grew even more serious about her music, playing around Glasgow in locations including amateur open-mic nights until she progressed onto Starbucks and bigger venues like Barfly. With her own unique blend of folk/indie/soft/alt rock, the precocious talent sent off homemade demos of her work recording in her very first studio — her bedroom — and later impressed London-based Melodramatic Records executive Pete Wilkinson who helped her polish the material. Sure enough, just six months later, she inked a deal with the same company that boasts an impressive roster including The Killers, Vertigo, and with after many higher profile performances in 2006, MacDonald signed a five album deal with Universal’s own Mercury Records. Initially motivated by popular culture including her older sister’s interest in Red Hot Chili Peppers and Ewan McGregor, one early inspiration for the aspiring songstress was none other than American actor Jake Gyllenhaal, whom she described as “the most beautiful thing that’s ever been created,” and in serving as an unlikely muse since the age of fifteen, she hammered out a tune about him in five minutes and called it “L.A.” The song, along with ten others (not including a hidden track) find their way onto MacDonald’s breakthrough debut album This is the Life, released in the states last month. Following up “Mr. Rock ‘N Roll,” MacDonald goes right into her title track, which was inspired by a memorable evening following a performance by rocker Pete Doherty, post-Libertines. The song, “This is the Life,” easily captures the natural high obtained from experiencing live music as she races through a chorus the way kids spin faster around and around on a tire swing as you can see below. A trumpet leads us into her next track, “Let’s Start a Band,” which lulls one into falsely assuming it’s a mournful, possibly patriotic ballad given the tone and MacDonald’s lovely accompaniment as she tenderly but proudly delivers the lyrics as though leading a sea chantey. Vocally growing stronger as she seems to play with scales operatically, soon she teases her listeners once again with “yeah-ah-ah,” building the work up until it makes its way into the catchiest, most simplistic yet undeniable shout of “Let’s Start a Band” repeated until one’s blue in the face a little past the three minute mark. To witness her incredible hold on the audience that knows her the best — check out this live footage below as MacDonald performs “Band” in Bristol, ironically the ideal location since she drops the name of the city during the song. If by now you’re starting to wonder why you haven’t heard of her yet, you’re not alone. But, I think it’s safe to say that, much like she promises in the previous song, “Give me a stage and I’ll be a rock and roll queen/Your 20th century cover of a magazine/Rolling Stone here I come/Watch out everyone/I’m singing, I’m singing my song,” it’s only a matter of time before her work catches on in the states. If the album has one flaw, despite my less than entirely enthusiastic reception to both “Youth,” and the over-produced “Footballer’s Wife,” which is lovely and begins like a 50’s style Douglas Sirk cinematic melodrama theme song seems out of place on what is essentially a “bar band disc,” it’s that sometimes it’s a bit hard to tell one song from another. While this could be a conscious choice of making sure every work flows into the next as she wholeheartedly succeeds with her final more contemplative, longing pieces like “L.A.” and “A Wish For Something More,” which tells a relatable tale of falling in love with a friend in the less than forty minute album, it could also reveal the fact that MacDonald’s range chord-wise may still be lacking as the same chords are repeated throughout the disc. Although given her tremendous natural ability and the way she seems to continually improve with each song, performance and year, it’s extremely easy to forgive with such a wonderfully addictive collection of songs that passed my very own “car test,” in that it’s been stuck in my CD player for roughly a week without switching albums. Thus, it should come with a warning label about dependency and I’m anxious to see what is next for the talented Scottish songstress but until that day, all I can say is buy two CDs (this one which you can download below and Travis’ Man Who if you don’t have it already) and call me in the morning.